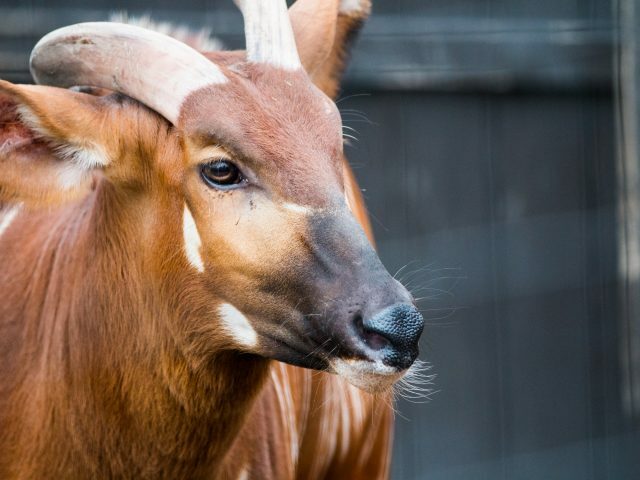 The largest of forest antelopes, bongos have a stunning chestnut-color coat with an average of 12-14 narrow white stripes. The animal has two heavy, slightly-spiraled horns that are hollow and made of keratin. Bongos can run quickly and gracefully through thick forest cover. They tilt their head up, which causes their horns to lie flat along their back so that brush doesn’t impede their flight. 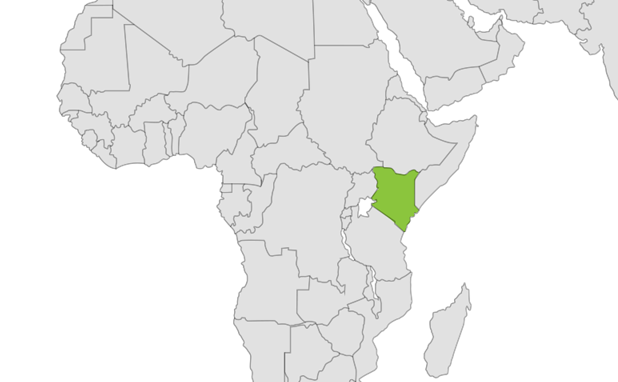 While western bongos are more common, eastern (or mountain) bongos are critically endangered and only found in one remote region of central Kenya. Bongos require a large amount of fresh food year-round, so they are usually found in forests that provide low-level green vegetation. 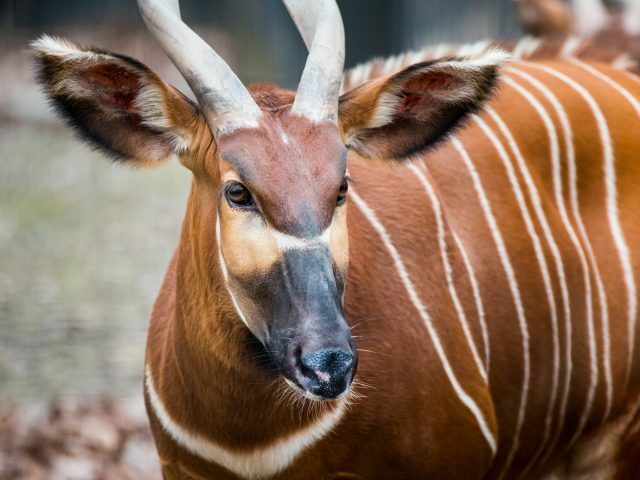 Bongos are the only Tragelaphus (antelope-like animals) in which both sexes have horns. 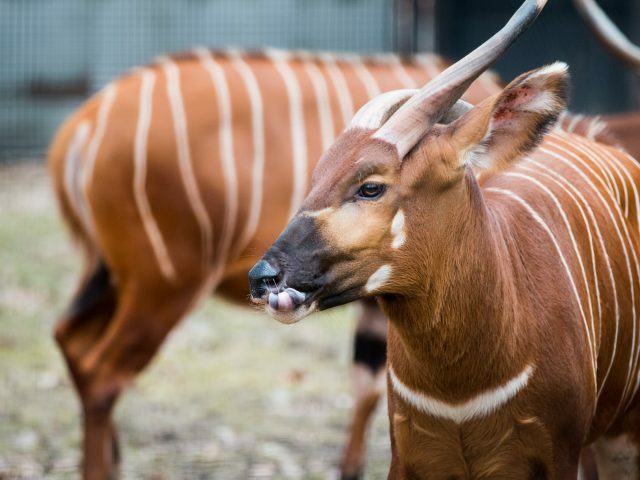 The bongo requires salt in its diet and often visits natural salt licks. They even eat burned wood and lightning-killed trees to obtain salt. The animal’s large ears account for why they rely on their hearing more than sight or smell. We have one bongo at Potter Park Zoo. Bella, a female was born in 2008 at Virginia Zoological Park. She did have a baby named Penny, who was born right here at the zoo in 2014. Penny moved to live at another zoo in 2017. 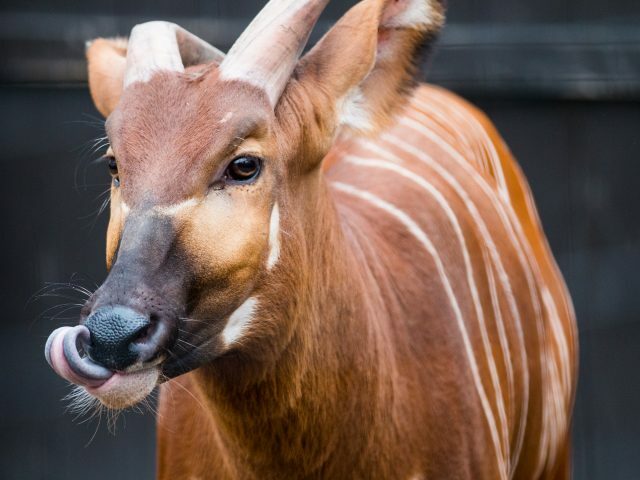 An adult bongo is typically between 3.5 and 4.3 feet in height and about 7 to 10 feet in length. Bongos weigh between 350 and 890 lbs, with males being heavier than females. The bongo is an herbivorous browser that eats tree leaves, bushes, vines, shrubs and fruits.